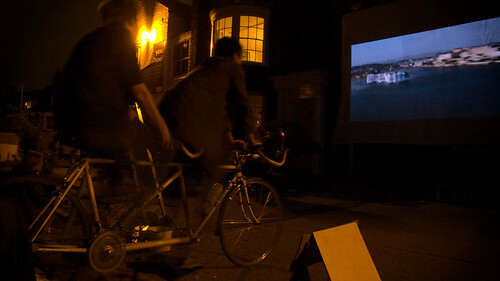 Every once in a while Transition Wivenhoe wheels out it's revolutionary pedal-powered cinema (you can come see it in action at the May Fair) and puts on a fun event, like when we teamed up with Moiving Image and screened Ghost Busters on Wivenhoe Quay for Halloween. We reckon we might have built the world's most efficient cinema, we do big screen and big sound to audiences of a few hundred and less using about 100 Watts of energy – about the same as one of those old fashioned light bulbs – so little that it can be powered by a bicycle and a simple renewable energy system. Bicycle Power is a great introduction to renewable energy, physics, bicycles, electricity, education, appropriate technology and lots more. Find out how to do it at one of our workshops at the Wivenhoe Bookshop Shed on the afternoons of the 2nd and the 9th of April. Courses are free (but space is limited) run from the 2pm 'till 5pm and will be followed by a fun activity in the evening. 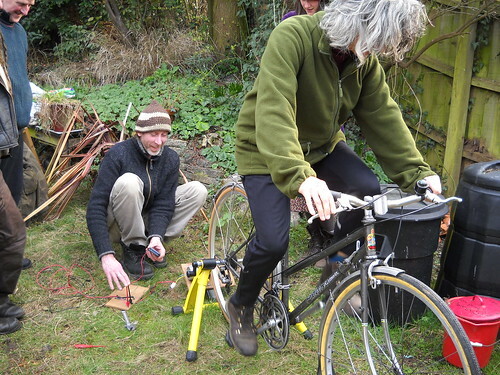 On the 2nd we'll show you how to build your own and on the 9th you'll find out how bicycle power can be used to make things (including brains) whizz and whirl at schools, community events and elsewhere.